With nearly 400 species separated into two families, sparrows are a highly diverse group of birds. Their habitats include almost any open area and none of the species are commonly found in thick forests. Some species have adapted to depend on humans, whether for food or shelter. Although both groups are called sparrows, the New World sparrows and Old World sparrows aren't closely related despite some physical similarities. Both taxonomic families Emberizidae (New World) and Passeridae (Old World) belong to the order Passeriformes, or perching birds. Emberizidae includes buntings and relatives, while Passeridae includes snow finches and relatives. Both are smallish, brownish birds that lack much color, especially bright colors. Emberizidae is a much larger family than Passeridae; Emberizidae and Passeridae contain 308 species in 73 genera and 40 species in 11 genera, respectively. 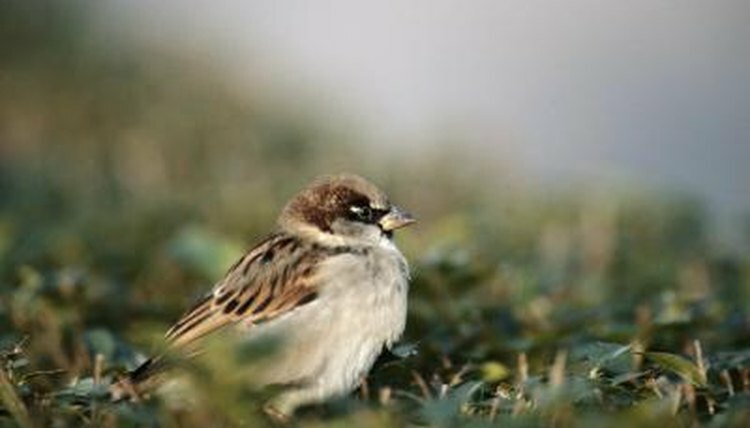 Many species of the Passeridae family live in open habitats, but these species commonly inhabit man-made shelters, particularly the house sparrow which has become invasive in the United States. These pesky little birds will graciously take any building and turn it into their home, including gazebos, shopping centers and barns. A few species of emberizids also inhabit urban areas, although they're not as likely to inhabit buildings as the house sparrow. Many of the New World sparrows inhabit open scrubland and some even nest on the ground. Sage sparrows, for instance, prefer sagebrush cover in their arid habitat and prefer to build their small, cup-shaped nests in living sagebrush. Field sparrows, on the other hand, prefer to build their nests near or even on the ground. Field sparrows prefer old fields and forest edges. Species such as the chipping sparrow prefer more wooded areas, but still not in dense forests. Chipping sparrows typically inhabit forest edges that are close to a wide, open area for feeding. Song sparrows often live in moister habitats, such as fields along the edge of freshwater bodies. Habitat and food preferences rely heavily on each other and dictate much of both the Old World and New World sparrows' living behavior. Both families are primarily seed eaters during the winter and insectivores during the breeding season. However, many sparrows will take what is easiest to come by. Both families feed and forage on the ground, gleaning both seeds and insects from plants. Some coastal species eat small mollusks. Those that live closely with humans, such as the house sparrow, will also eat trash and waste left from humans.